“It’s just sheep.” Marie puts her hands to her throat as if to hold in hysterical laughter, but tears glisten on her cheeks. I can’t blame her. I’m pretty close to the edge myself. 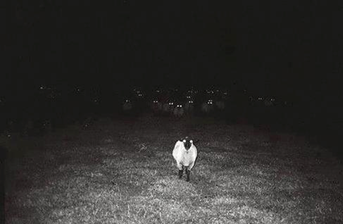 And I’ve just wasted five seconds of precious battery to illuminate the field so we can see that the noises that have been stalking us ever since we got lost are just sheep. We’ve only been hiking in the dark for an hour or so. Until then we thought we were just a little behind where we should have been. The trail looked familiar. We could see well enough in the twilight. But where the trail should have flattened out into the valley and a mile through winding woods to the car, we found ourselves in something like a pasture, with a stream running down the middle. By then it was getting too dark to see our path. We figured hell, it’s been years since we hiked this trail, maybe somebody cut down the trees and converted it to pasture. It didn’t look right, but when we went to check our GPS for the thousandth time, it couldn’t connect to its satellites. No cellphone reception, either, but that’s not unusual in the mountains. Marie keeps trying, but I turned mine off to save the battery. That’s why I could turn on the flashlight app for just long enough to see the floppy ears and intent expression of the sheep leading the herd. “Their eyes were glowing,” I point out. “Why bother? We only have one way to go. Look how steep those ridges are.” Were they that steep when we started to walk this direction? No. And they weren’t that visible, either. The moon has conveniently come out to light up the impossibility of going up the sides. It illuminates the sheep, grazing peacefully while lambs nuzzle at their mothers’ sides, seeking nutrition or comfort. There’s no reason the sight should make my blood run cold. I tell myself to calm down and think, but I don’t seem to be listening. Only one thing seems clear: we have to get the hell out of here. “This way,” I say, turning back the way we came. The barely-a-mountain we came down earlier seems as tall and jagged as Mt. Everest. I wonder why I never noticed before that when she’s nervous, she bleats like a sheep. I turn to run up the steep path. Her laughter is like a whip into my flanks. The moon peeps out again, momentarily illuminating a patch of green grass beside a shallow pool in the stream. I stop. The rippling water fascinates me. I drink deeply. I have been walking too long without stopping for water. Marie has gone up to the leader of the sheep. They’re touching noses, cautiously. I wander over to the grassy patch and start grazing. Damn, the grass tastes good in this high meadow.